This error appears when attempting to request a resource from Nginx using HTTPS with Chrome. This error suggests some issue with the negotiation of the cipher between the client and server. Wireshark can be used to determine the ciphers that the client web browser can use, and the cipher being produced by Nginx. Before modifying Nginx SSL/TLS settings, determine if the issue is client-side by navigating to https://badssl.com and selecting tests that are similar to your Nginx setup. For example, if your Nginx site is using a self-signed certificate, select the "self-signed" option at badssl.com. 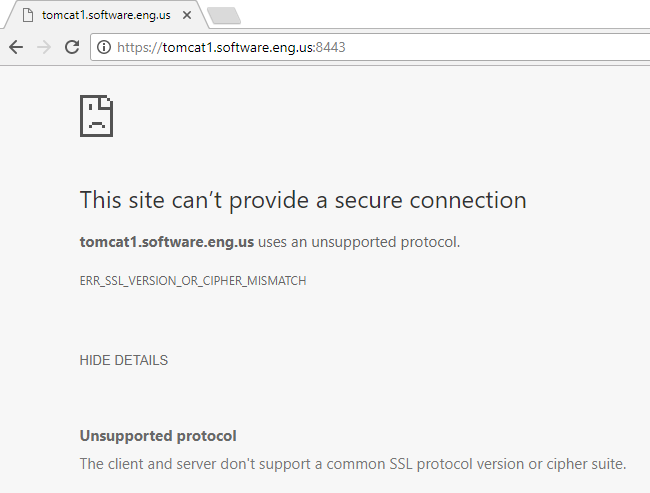 If "This site can’t provide a secure connection" appears on badssl.com, this suggests a client-side issue. For example, the client browser may be configured to refuse connections to sites using a self signed certificate. Inside of the server block in the /etc/nginx/nginx.conf file will be SSL parameters. When creating the public certifcate and private key, a certain type of cipher will be used, such as RSA, DSA, or ECDSA. The browser will need to support the type of cipher being used by the public certificate and private key. In the prior markup, ssl_ciphers is set to High and not Null and not MD5. If you would rather specify the ciphers being used, you can use one or more of the following ciphers. In the log_format block in the /etc/nginx/nginx.conf file, add $ssl_protocol/$ssl_cipher. This will allow you to see what cipher was used. The /var/log/nginx/access_log file will now include the SSL protocl and cipher that was used. 10.1.15.14 - - [14/Jul/2017:19:28:12 -0500] "GET /Signin HTTP/1.1" TLSv1.2/ECDHE-RSA-AES128-GCM-SHA256 . . .